The race started with a barrage of fireworks, as Joel Berkley led Richard Cook in to the first turn. 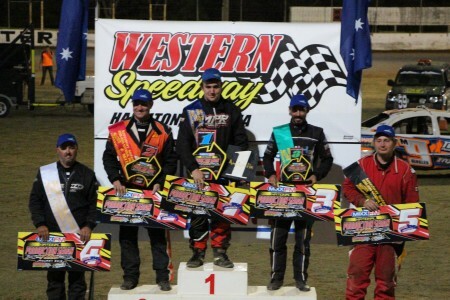 Behind the pair, Beau Riley and Justin Hawkins were continually swapping positions, with Craig McAlister also getting a good start, making up two positions in the opening laps. 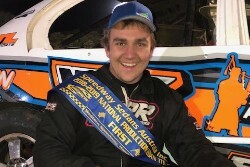 After four spectacular laps, with numerous positional changes as the field raced two and three wide, Ben Barker spun with Trevor Mills deemed to be the primary cause, sending the National Title holder to the rear of the field. The next eleven laps would be frantic to say the least, with Joel Berkley continuing to lead as Dehne Sparrow started to make great moves on the outside, to the delight of the local fans. Sparrow, who started from position five, was shuffled back in the opening stages to eighth place, but then started to claw back positions on the outside. By lap eleven Sparrow had moved to fourth, and in a great move on the outside passed both Riley and Cook to take second just before a crucial stoppage. 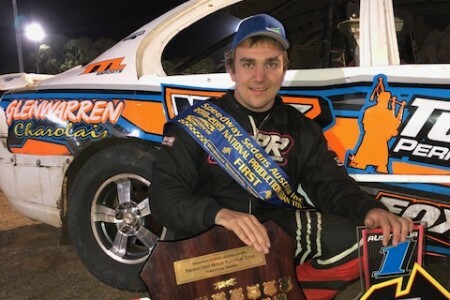 A massive rollover on lap fifteen saw the demise of Jake Blight, which would also see Jayden Edwards retire with a flat tyre along with James Hodak. Soon after the Western Speedway erupted as Dehne Sparrow took the lead on lap eighteen, as Richard Cook, Beau Riley and Justin Hawkins chased Sparrow and Berkley. The field was bunched again with twelve laps remaining after Matt Hutchison spun on Turn two as Berkley regained the lead soon after the stoppage, as the battle for second place intensified with Sparrow, Riley, Cook and Hawkins swapping placings continually as Berkley drove away to a brilliant win. In a desperate last lap, Sparrow held off Justin Hawkins, Beau Riley and Richard Cook in a blanket finish.